Whether this hyperbole is true or not is up for debate, but there’s no questioning the continuing allure of the ‘original’ cryptocurrency, which is now a relative old timer given that it was created nearly ten years ago at the time of writing. People continue to be drawn to bitcoin with its semi-mythical status and are desperate to know how they can get there hands on some, preferably without spending a lot of money. Aside from investing your own money, there are many ways you can get some coins either as payment for your work or free. 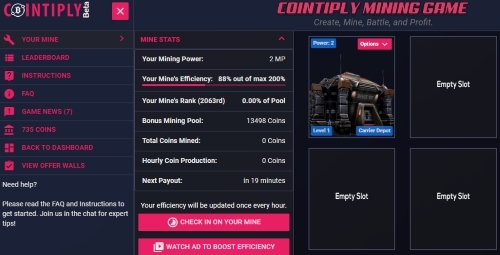 The purpose of this article is to explain how you can get your first coins without any financial outlay through a website called Cointiply. We’ve talked a lot about free bitcoin faucets on this site and to a certain extent Cointiply is an extension of this as there is a free faucet available on the site. But the reality is that Cointiply is much more than this an offers a wide range of methods to get hold of some free Satoshi (fractions of bitcoin). The site is more of a portal which offers a varied selection of earning methods to visitors. These range from surveys and offerwalls, to mining, playing games, viewing videos and adverts and downloading and testing apps. We’ve experimented with the various revenue streams on the site and our view is that it’s completely legit and one that you can trust to pay out the cryptocurrency that you earn. Also, we’ve yet to come across any scam reports. However, we’ve found plenty of positive reviews across the web, including this thread on the highly respected Bitcointalk forum. 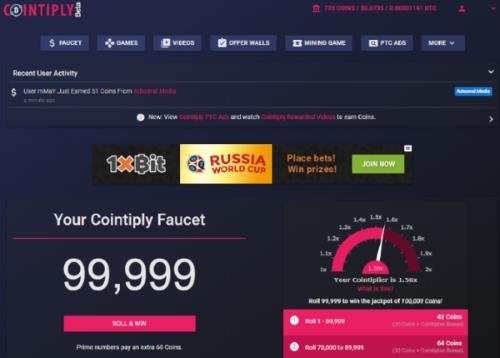 Like the hugely popular Coinpot family of faucets, Cointiply offers a 1% loyalty bonus for every consecutive day you claim from the faucet, up to a maximum of 100%. This can be very handy in helping you collect a withdrawable amount of coins sooner. You can also increase your earnings using the sites Cointiplier function. This is a faucet earnings multiplier which increases over time the more you engage with the site. If you become a regular visitor that earns from multiple sources then this is a useful way of gradually increasing your earnings even more. One thing that have noticed is that there are occasional pop-ups as you navigate the various sections. This is mildly annoying (although not a deal-breaker) but it’s possible to upgrade to a premium account to remove them. You agree to pay a set amount of coins per month to have the ads removed. In addition to this there are other benefits to premium membership as well, such as early access to new features, the ability to skip a couple of days without claiming and maintain your bonus and random coin bonuses. From the user’s perspective, Cointiply is nicely laid out and is easily navigable. There’s nothing complicated about the sign-up process and you’ll be earning your first coins within minutes. This is key to getting more people involved in the world of cryptocurrency and comfortable with using bitcoin and other currencies. The other appealing thing about Cointiply is that there’s plenty to do to keep you occupied and earning, and some of the games are actually quite addictive, such as Cut The Rope. You’ll find yourself wanting to play on even if you’re not earning coins – the fact that you are is a bonus! It’s worth noting that you earn Cointiply ‘coins’ for each offer you complete, but there’s an instant conversion rate on-site so you know exactly how much these are worth in bitcoin (and dollars) at any given time. You’ll need a bitcoin wallet to receive your earnings (paid out when your balance reaches 35,000 Cointply coins). 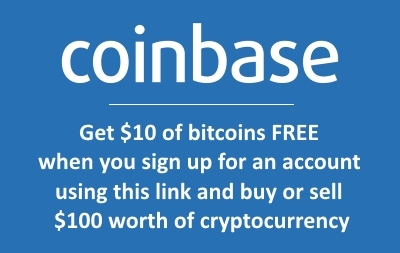 We’d recommend Coinbase for this. It’s easy to use, offers a simple set-up process and is one of the most popular and respected wallets/trading sites in the world. If you sign up using our referral link and buy or sell more than $100 worth of cryptocurrency you’ll earn $10 worth of free bitcoins (and so will we!). Once this is set up you can start receiving your Cointiply earnings. It’s then up to you what you do next – you can hold them in the hope the value will go up in the future, trade them for a different currency, sell them or spend them. The world’s your oyster! Our overall verdict of Cointiply is that it’s a hugely promising site with plenty on offer and lots more to come. Definitely one to join if you’re looking for free bitcoin.